You’re rolling out, so you better get this party started. 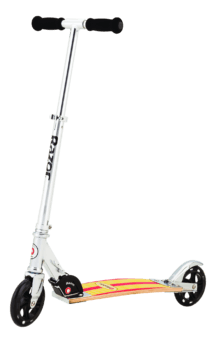 Step on the deck of the Party Pop Scooter and the pulsating multi-colored lights will illuminate your arrival as you kick and glide your way to your next social commitment. Colorful, high-quality urethane wheels andpatented rear fender brake allow for quick stops. You’re a person in demand, so roll out in style and make an entrance they’ll remember. Absolutely Great!I bought this for my 9yr daughter and she LOVED it. After I unpackaged the scooter, right away she took it to our backyard and started riding on it. The party scooter :)The party pop scooter is such a beautiful design for a girl. My neice is in love with her new scooter and more than anything she loves that her scooter lights up.